SALE: Save 10% when you order 1-5 units and 25% when you order 6+ units. Valid through 04/26/2019. For orders over 13 ounces, here are the rates for USPS priority mail (with tracking number). Remember: no sales tax on any order ever! 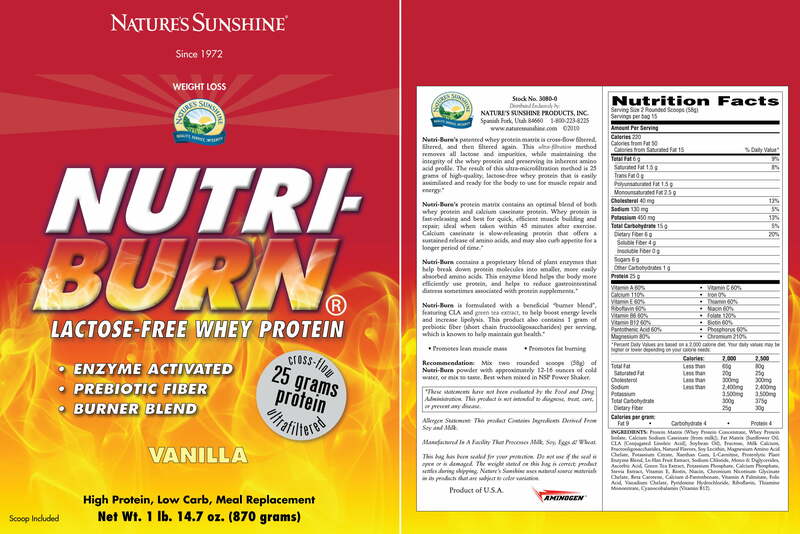 Nature’s Sunshine Nutri-Burn® is specially formulated to assist the body in increasing lean muscle mass. This protein drink mix contains protein matrix, CLA, fructo-oligosaccharides, l-carnitine, proteolytic plant enzyme blend, and green tea extract along with key vitamins and minerals. 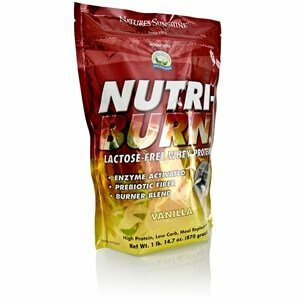 Nutri-Burn blends protein from two sources, whey and calcium caseinate, to stimulate efficient muscle building and repair. As lean muscle mass increases, the body’s resting metabolic rate also increases. 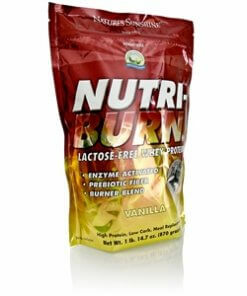 The formula also contains plant enzymes that assist in breaking down protein into easily-absorbed amino acids. One gram of fiber is included in the formula to promote intestinal health. 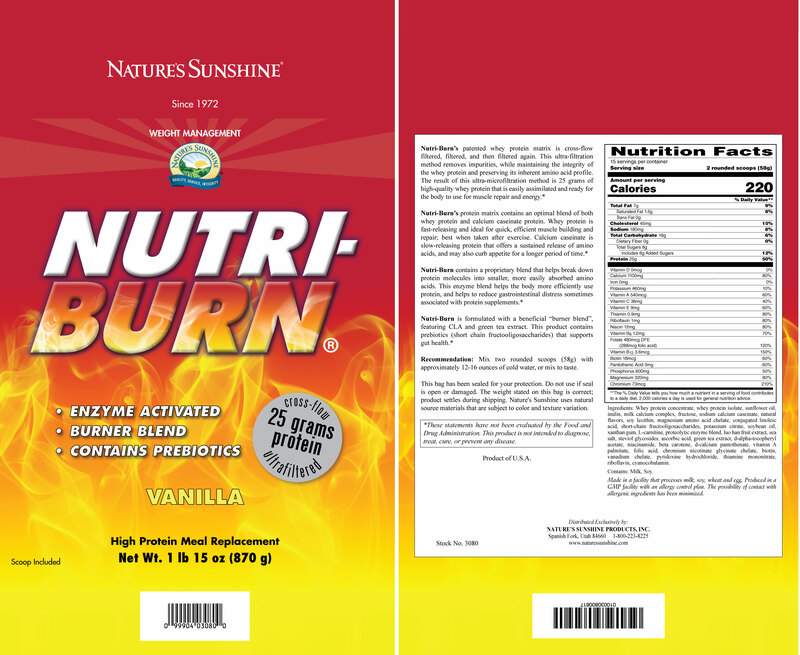 One serving of Nutri-Burn is 2 rounded scoops of powder mixed with 12 to 16 oz of cold water. 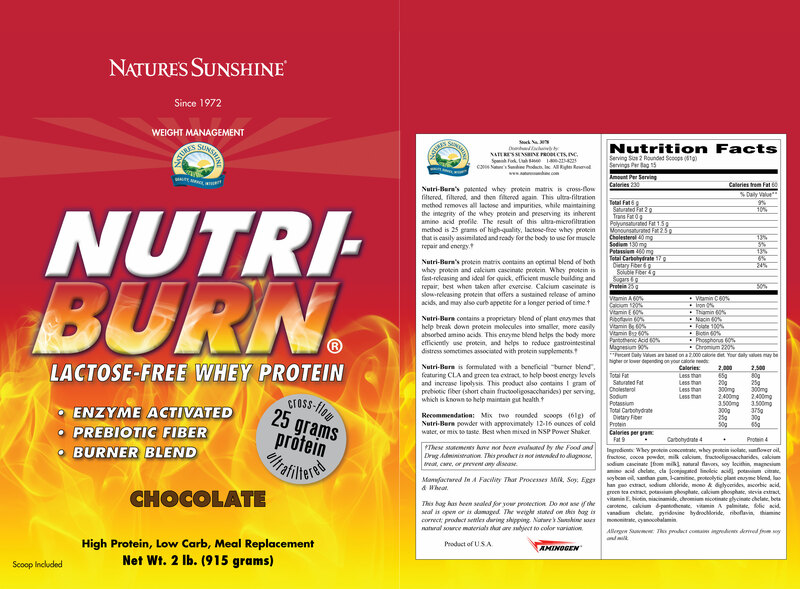 Instructions: Mix 2 rounded scoops of Nutri-Burn powder with 12–16 oz. cold water or mix to taste. For best results, use the NSP Power Shaker. 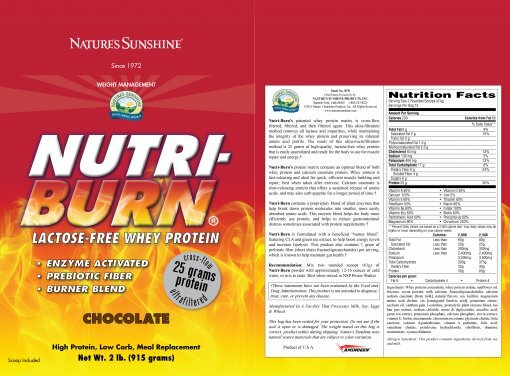 Protein Matrix (Whey Protein Concentrate, Whey Protein Isolate, Calcium Sodium Caseinate [from milk]), Fat Matrix (Sunflower Oil, CLA [Conjugated Linoleic Acid], Soybean Oil), Fructose, Cocoa Powder, Milk Calcium, Fructooligosaccharides, Natural Flavors, Soy Lecithin, Magnesium Amino Acid Chelate, Potassium Citrate, Xanthan Gum, L-Carnitine, Proteolytic Plant Enzyme Blend, Lo Han Fruit Extract, Sodium Chloride, Mono & Diglycerides, Ascorbic Acid, Green Tea Extract, Potassium Phosphate, Calcium Phosphate, Stevia Extract, Vitamin E, Biotin, Niacin, Chromium Nicotinate Glycinate Chelate, Beta Carotene, Calcium d-Pantothenate, Vitamin A Palmitate, Folic Acid, Vanadium Chelate, Pyridoxine Hydrochloride, Riboflavin, Thiamine Mononitrate, Cyanocobalamin (Vitamin B12). 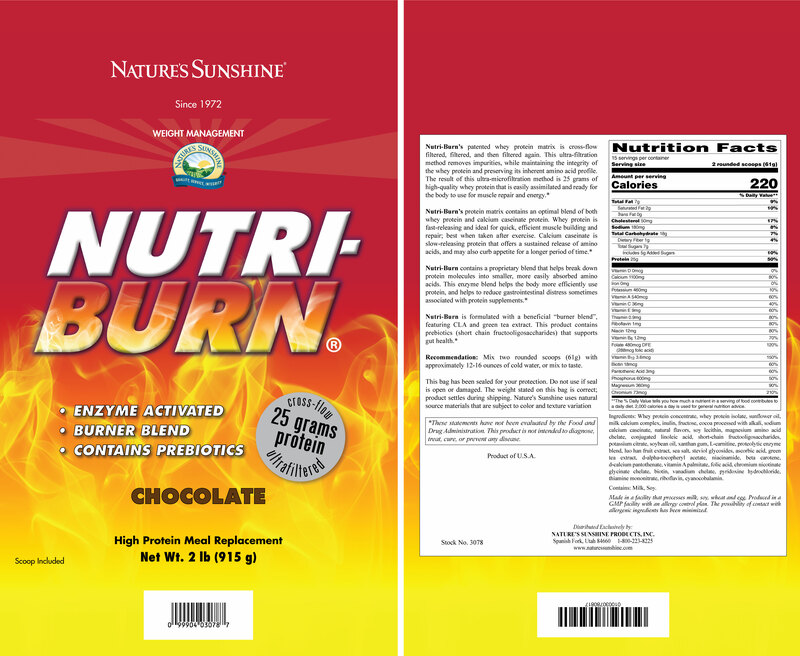 Caring Sunshine offers an unconditional money back guarantee for 60 days after you receive your order. We want you to be satisfied!